Photo: Best budget digs in Phan Thiet. 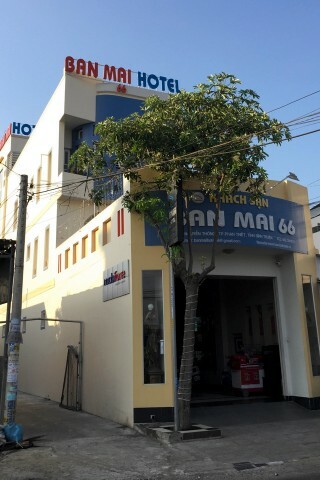 Located at the eastern edge of the city, Ban Mai 66 is the best budget accommodation in Phan Thiet. This is a new family owned establishment and they are still learning what foreigners want in a stay, but are eager to learn. The rooms are neat, clean and come with windows and a bed with a medium firm mattress, bedside table and plug. Air-con and WiFi are standard features, as well as a flatscreen TV, minifridge and a couple of cushy chairs. The bathrooms are narrow, with everything you need squeezed in so it does mean you are practically showering over the countertop. The shower does deliver piping hot water. For guests, the location will either be ideal or not ideal at all. It’s located at the eastern edge of the city, just before the bridge leading to the Po Shanu Cham Towers and Mui Ne. You are essentially equidistant between the start of Mui Ne’s tourist strip and Phan Thiet’s downtown core. It’s not close to the train or bus station, if that is the convenience you’re after. But Ban Mai 66 can be a good base if you want to use the beaches of Mui Ne without staying in the tourist town – Ban Mai 66 is on an arterial and you’ll see local buses (either the red or white) passing every 20 to 30 minutes that will travel the entire length of the tourist strip. There’s nothing of interest in the immediate surrounds – you’ll need to travel to get to the eats, beaches and sights. The hotel does rent motorbikes, which isn’t standard in Phan Thiet City’s accommodation. The family is very sweet. No English is spoken however their gestures speak volumes, such as giving us fresh fruit in the room, daily housekeeping and even restocking the bathroom in the evening. Check rates at Ban Mai 66 on Booking.com.